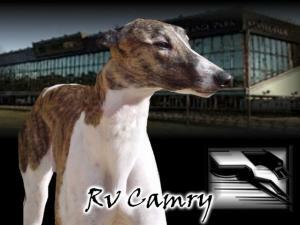 Camry was a great racer then became a brood mom for a few years after she retired. We just got her from the brood farm. She is an older gal now at 10 years old. Her DOB is March 4th 2003. Her sire is the famous Gable Dodge and her dam is RV Sensational. She is a tiny girl that raced at only 54lbs. She was a special girl that one of our volunteers wanted brought in. She will be staying with her if she does well with her other dogs so probably won't be available. The photo of her is one from her racing days and she has a little more white on her face now.